One of the people I’m saddest I never was able to meet is Shawn’s mother, Sharon. She passed away a few years before Shawn and I met, and though I was never able to know her, I feel that she still has an impact on our life together. Shawn always tells me stories about her and it’s easy to see how much she did for her five children. She was a talented cook and went out of her way to make celebrations special. When Shawn and some of his siblings went vegan, she would adapt her recipes to make vegan versions. Often times, Shawn will tell me something she used to make and we’ll try to recreate it. 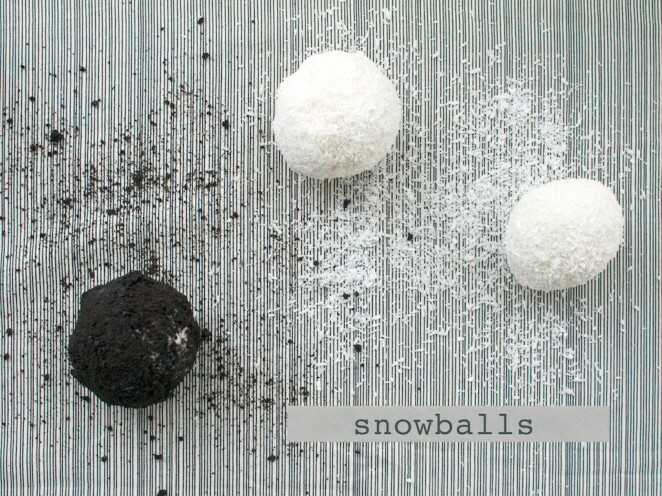 These snowballs fall into that category. 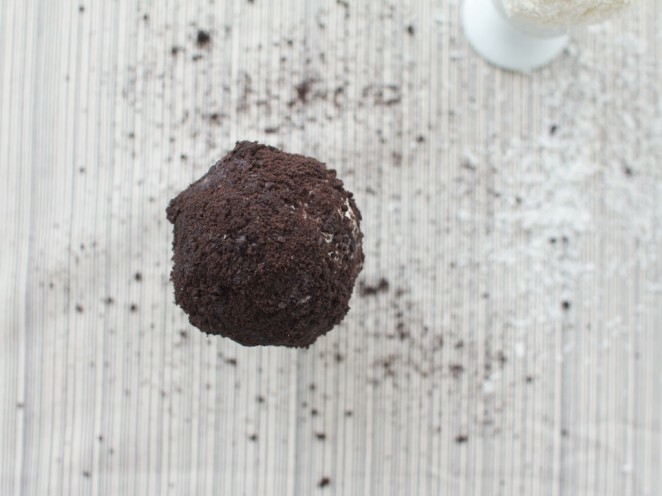 A simple to assemble treat that is exponentially more tasty because it is fun to eat. With warmer weather rolling around (maybe?) I can see we’ll be making more of these. 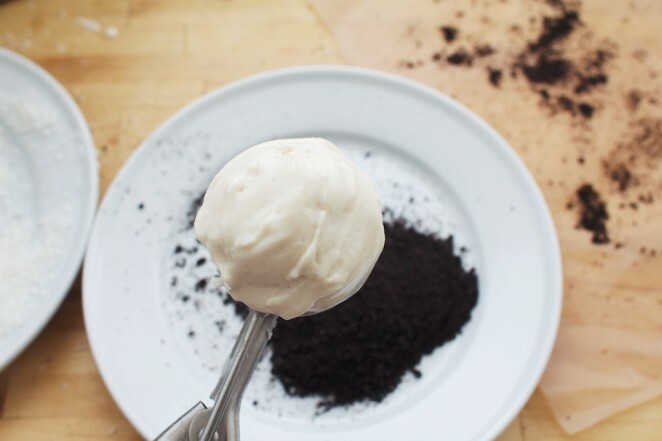 Start with a scoop of your favorite non-dairy ice cream. 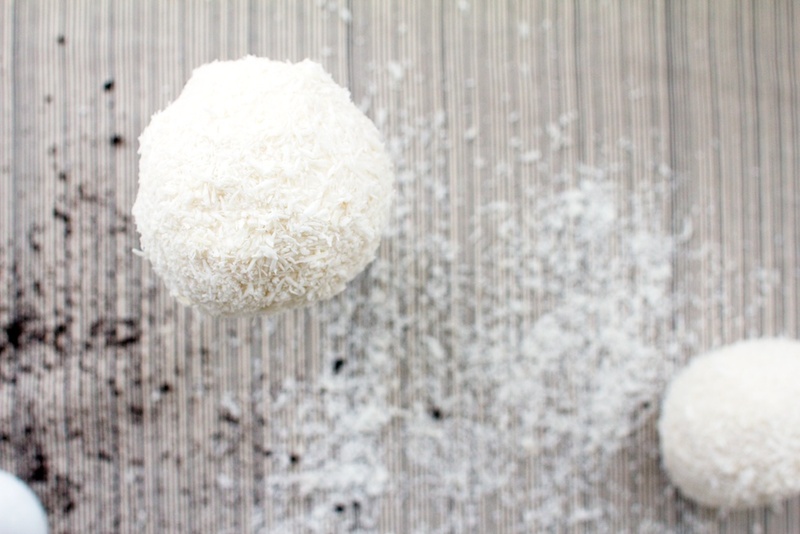 Roll it around in some coconut. Use your hands. It’s not even that messy. Place on a cookie sheet and freeze for 10-30 minutes. That’s it! You now have a snowball. Now personally, I’m not a fan of coconut, but I didn’t want to be left out of the snowball fun, so I made some “dirty snowballs” with crumbled cookies instead. Thank you Sharon for still being an inspiration, even though we never met. Mostly though, thank you for raising such an amazing son who I adore so much. 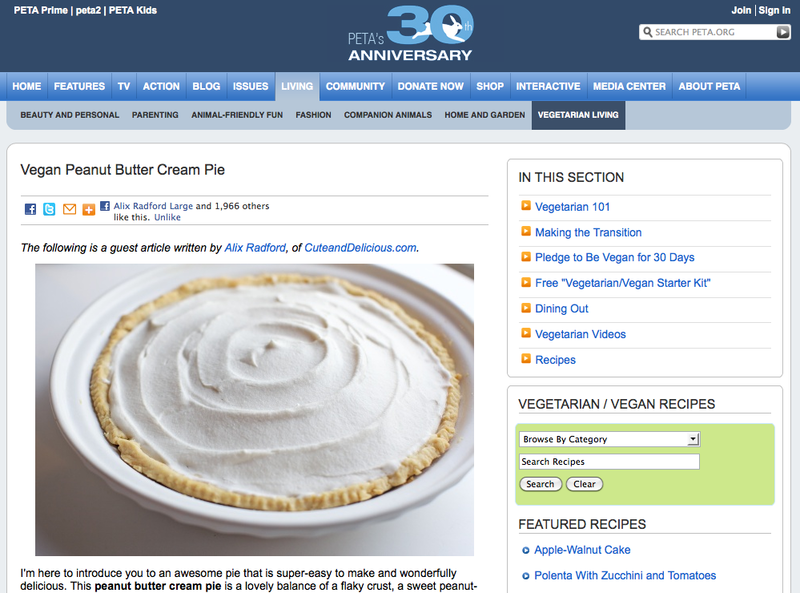 I’m super excited that my recipe for this wonderful Peanut Butter Cream Pie was featured on PETA’s Vegetarian Living Blog. I’m so happy to be able to share with so many people who are looking to know more about veganism. 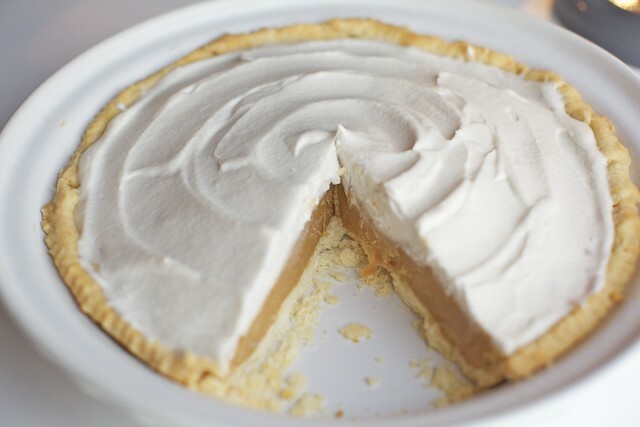 I’m reproducing the recipe here for posterity, and of course to not leave out my dear readers who definitely need to know how to make this super sweet pie. This peanut butter cream pie is a lovely balance of a flaky crust, a sweet peanut-butter filling, and a fluffy coconut-cream topping. It takes a bit of advanced preparation but nothing more than putting a few cans of coconut milk in the fridge the night before. 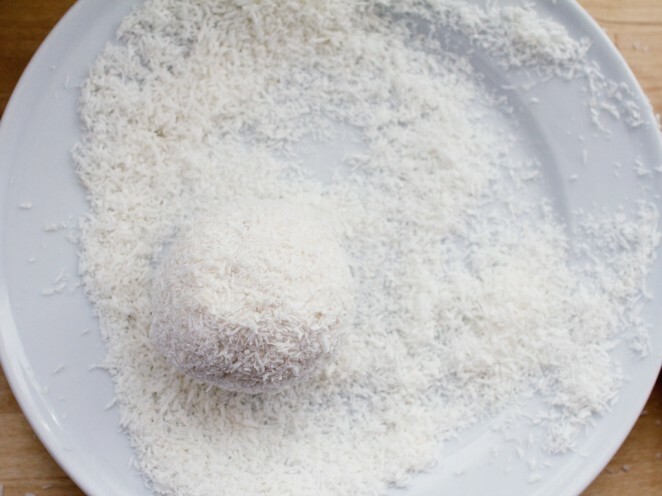 You’ll want to make sure that you use the full-fat coconut milk, as this is what makes the dense coconut cream topping. It’s my favorite. In fact, you can use it as a topping on just about any cake, ice cream, or pie. Trust me when I say that you’ll want to. Let’s start with the crust, shall we? 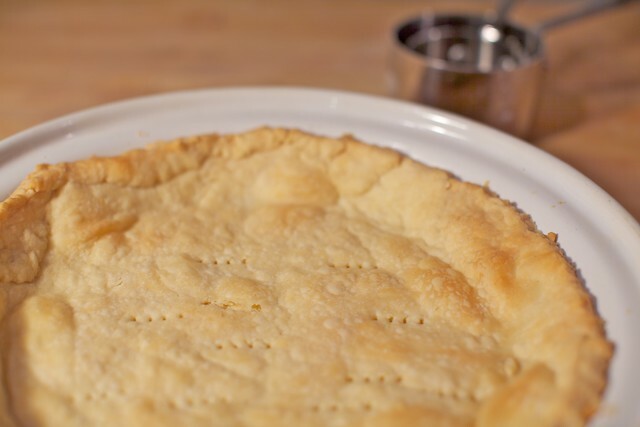 This is a versatile crust that you can use for any sort of pie, either savory or sweet. Mix the flour and the salt together. Cut together the flour mixture with the nondairy butter using a fork, two knives, or a pastry cutter. 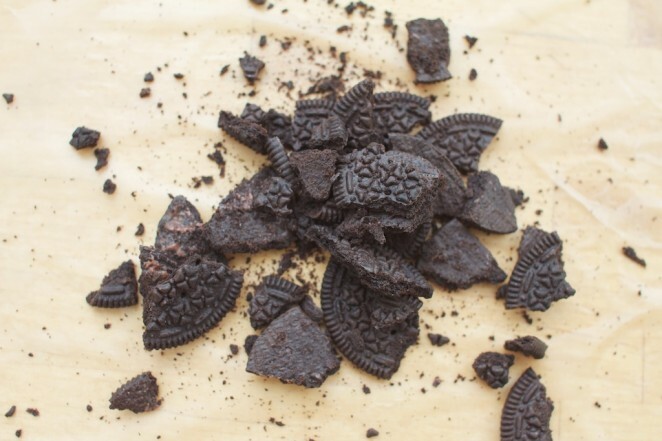 Combine until the mixture resembles crumbs. Slowly incorporate the ice water until the dough just starts to hold together when pressed between your fingers. Shape the dough into a disk and wrap in plastic wrap. Refrigerate for at least 30 minutes. Lightly dust your work surface and rolling pin with flour. Roll out the pie crust until the dough is about 1/4 inch thick. Roll from the center out so that it’s even. Drape the dough over your rolling pin and transfer to a pie dish. Press the dough into the corners and trim off any excess hanging over the dish. Using a fork, poke a few holes in the bottom of the crust to prevent air bubbles. Bake for 15 minutes, or until the edges are golden brown. Set aside to cool. Make sure it cools completely before you assemble the pie. Next, we’ll put together the filling. It is essentially two layers, but we start with the coconut cream, as it is the base for the whole thing. Ideally, it should be made in a stand mixer, if you have one, as this allows the cream to become extra fluffy. If you don’t have a stand mixer, you can still make it with an electric hand mixer; just be sure to at least double the beating time. You want to incorporate as much air as possible into the mix. Also, I recommend using a metal bowl if possible. As for the peanut butter, choose whichever type you like best. I like a creamy pie, so I go with creamy peanut butter. If you like crunchy, though, I bet that would be great. Just be sure to skim off any excess oil at the top of your jar. 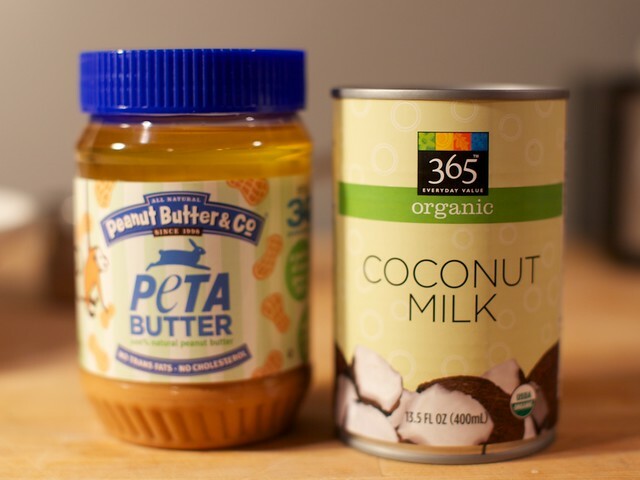 You can always add it back into your peanut butter jar later or use it for cooking up some stir-fry. If you use an unsalted peanut butter, add an additional 1/4 teaspoonful of salt to the mixture if you like. OK, now let’s get to that pie-making! 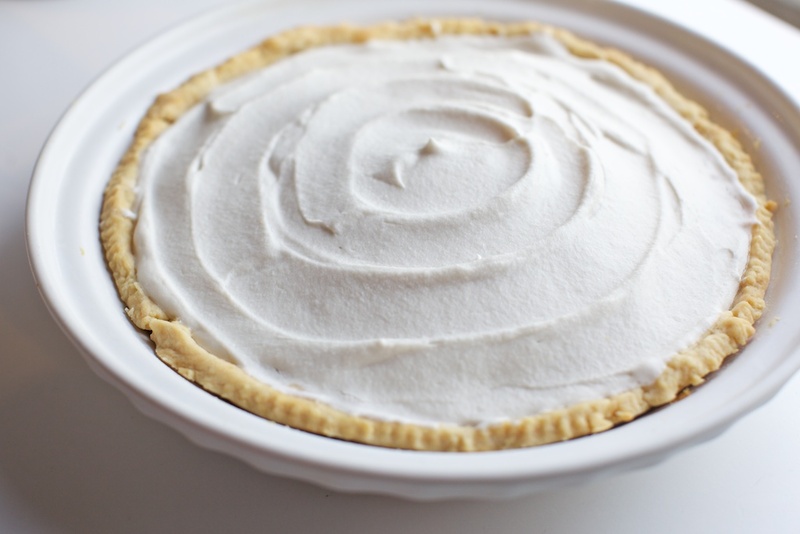 The night before you are planning to make this pie, place the coconut milk in the fridge. Beat on high until the mixture is fluffy and thick. Add in 1 cup of the powdered sugar and mix until all the sugar is incorporated, scraping down the sides as necessary. Beat until fully combined. Add the vanilla extract and beat for 3 to 5 more minutes. Set about 2/3 of the mixture aside in a cool place. This will be the topping. Add 1/2 cup of the peanut butter to the mixer and beat until fluffy. Add the remaining 1/2 cup powdered sugar and beat until combined. Finally, beat in the last 1/2 cup of peanut butter until creamy. Spread the peanut butter mixture over the bottom of your cooled pie crust. Gently spoon the remaining whipped coconut cream onto the peanut butter layer. Refrigerate for at least an hour before serving.